So we met at Kyoto station and left straight away for the subway, destination: the Toofuku-ji temple, one of the five major Zen temples in Kyoto. The place was packed with people, which was quite understandable as it was sunday and the leaves couldn't get much redder like they were now. In fact, the Japanese are so fond of the red maple leaves that the weather forecasts on television show how red the leaves will be in different parts of Japan! 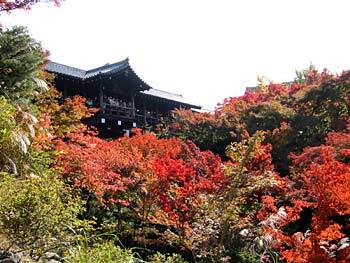 The garden had a beautiful display of autumn colours and the Japanese went trigger happy with their cameras. Maki and Aya were also taking photographs of us by turns and I realized that Japanese camera culture is about posing in photos rather than taking "clean" photos of the visited site itself - more than I've been used to anyway - but I quickly got the hang of this custom. We took a breather in front of a small rock garden covered with moss and walked around the main garden again while taking more photographs. Then we left the temple and searched for a restaurant where we could have lunch. We ended up in a traditional Japanese restaurant, where I witnessed the busiest waiter ever. It felt like she was serving customers in the fear of losing her job if she can't keep people entering, ordering, eating and leaving the restaurant is quickly as possible. This is because restaurants aren't meant to be places to sit down and chat, but purely just to eat. If you want to relax, go to a cafe where you can stay as long as you like. I don't know what kind of hasty comments she was throwing at us by the corridor, but Aya and Maki were embarrassed of the scenes she made. The food itself was a mixture of chicken and rice, which was tasty, although I don't remember what it was called anymore. Once we left the restaurant I was taken east of Kyoto by train to the Higashiyama area, as Aya and Maki had the idea of hunting me a geisha to be photographed. It was still quite early to see any geishas or Geiko as they are called in Kyoto. They usually leave their tea house after serving their customers around dusk , so we decided to take a look at a temple before that near by. We visited the Chion-in temple (founded in 1234, present buildings build in the 17th century) and observed for a moment a buddhist service going on inside. I was told that young Japanese these days visit a temple as rarely as Finns go to church (in my scale less than once a year, usually the reason being a wedding, funeral or other special event). Nothing surprising, but I felt like mentioning it since I was on the subject. Heading south with the rest of the Japanese crowd taking a nice Sunday walk, we took a short rest at the Maruyama Park and talked about various things. After the break continued south, tasting tea and various pickles along the way some shop keepers were offering. Aya suddenly spotted two maikos (apprentice geisha) about 40-50 meters away from us. I was glad to even see a glimpse of them, but Aya and Maki insisted we should go after them to get a good photograph (one estimate says there are only about 100 geishas in Kyoto left, I don't know the figures for maiko though). So we followed the maikos although I really didn't want to bother them too much, since I didn't like the idea of stalking them like some paparazzi. We soon caught up on them, which wasn't hard since they were walking on those geisha-style platform shoes, not really ideal for running. HOLY HECK they looked stunning!! When I was desperately trying to check my camera settings were right before taking a quick photo, I suddenly noticed Aya had talked to one of them and she said it was okay to take a photograph of me and the maiko together! Stunned by this opportunity, I gave my camera to Aya, posed with the maiko, thanked her in the most polite way possible (doomo-arigatoo-gozaimasu!) and hoped that we weren't a total nuisance to her! Totally overjoyed by that treat we continued walking around the streets of the Gion district, which had at places a charming touch of old Japanese housing architecture. It was getting a bit late, so we left the Gion district, went past the Kamo-gawa river and found a café to rest our tired legs. After talking for some time about various subjects and calling it a day, my Japanese friends escorted me to the nearest bus stop and made sure I got on the right bus before bidding farewell. The bus trip itself was quite funny, since the at some point the bus driver forgot to turn off the microphone he uses when he announces the next bus stop. Because of this, all his humming, chewing and talking to the passengers leaving the bus was heard on the speakers. Somehow the passengers were very calm with the situation while I tried not to burst in laughter myself. Update: Though at the time I was convinced that I did see a maiko, these days I'm more certain she actually was just a Japanese tourist dressed up as one, as they are a much more common site these days than the real thing. Even so, she still looked stunning. The Tsuuten-kyo bridge at the Toofuku-ji temple area. 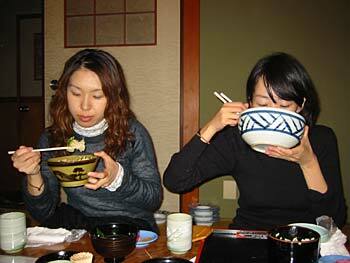 Having lunch in a traditional Japanese restaurant with Aya and Maki. 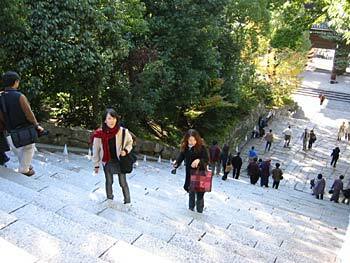 Stairway to yet another temple! 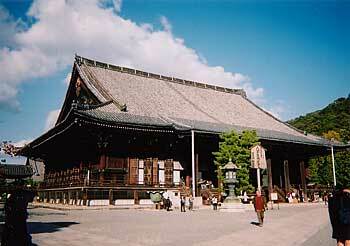 Kyoto happens to have over 1800 buddhist temples and shinto shrines. Highlight of the day, catching a photo with a "maiko". Talk about contrast between us! 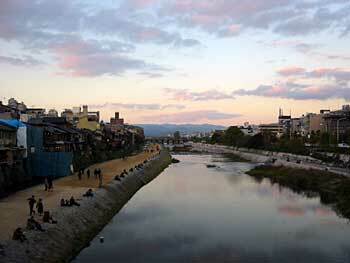 Crossing the Kamo-gawa river, where some locals sit down to have a rest. Toofuku-ji temple - More information of this zen temple can be found from their website. Immortal Geisha - Interested in the world of geishas? Then this website is worth checking out.